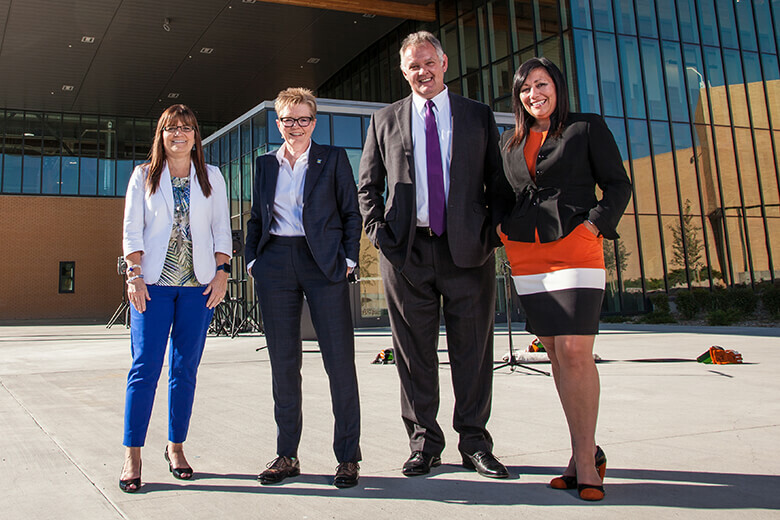 Founded by forward-thinking members of the community, Lethbridge College remains true to its mission and vision under the direction of the Executive Leadership Team, led by president and CEO Dr. Paula Burns. In the spirit of accessibility, affordability, quality, accountability and diversity, ELT provides strategic leadership in the translation of board ends to strategy and the operationalization of our vision and mission. Lethbridge College is guided by the work of members of the College Leadership Council (CLC) and Deans’ Council. CLC helps shape the college’s strategic direction and provide leadership on significant college-wide initiatives, while the Deans' Council provides planning, management, supervision, and accountability for all academic matters at Lethbridge College. Learn more about the work of the College Leadership Council. Leading and transforming education in Alberta. Academic transformation: We are collaboratively creating innovative and creative learning experiences that meet the diverse and integrated needs to learners, the economy and society. Collaborative partnerships: We are model collaborators focused on achieving unprecedented levels of collaboration in education. Resource innovation: We are creating entrepreneurial business models and expanding revenue sources. People development: We develop our people to realize their highest potential. People: We value our people by promoting trust and respect among all stakeholders, supporting their professional development and celebrating their accomplishments. Excellence: We do things well by providing exceptional instruction, offering effective learner support services and remaining responsive and innovative. Success: We promote learner success by offering current and relevant programs, using instructional technology creatively and employing flexible delivery systems.